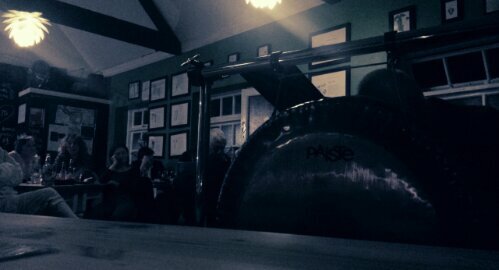 The AMM performance at the Veg Box café tonight must rank as one of the most intense musical experiences I’ve had. It was like the gig I’ve been wanting to go to all my life! I really wish I’d discovered this sort of music when I was 18 – it pains me to think of all of the people I could have seen if I’d taken this route sooner. I wouldn’t mind but I wanted to find weird music back in 1979 but I suppose I needed someone to point me in the right direction – there wasn’t any internet or wiki back then – it was all word of mouth and unfortunately I ended up going the long way round! The venue was superb – small but laid out so there wasn’t a bad seat in the house. It is a veggie café and the directions involved looking for a fire escape at the back of a carpark! At first I thought I’d come to the wrong place or on the wrong night but then I spotted the piano and percussion so I knew got it right. I was standing waiting to buy a drink when the organiser from Free Range asked if I was Kevin – I can’t think how people know who I am all the time. He had, true to his word, kept a space for me and there was a seat with a card and my name on it! 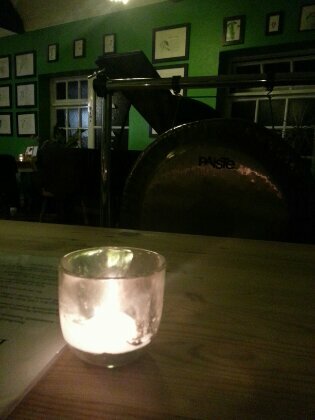 He said I didn’t have to sit there so I moved to a table down by the musicians – right in front of Eddie Prévost’s gong! Sarah often asks me why I go to gigs on my own and the answer is simple – I like music and hate it when I’m distracted from this obsession by other people. So it was annoying when this chap came and sat next to me and started wittering on! I made polite conversation and luckily he started talking to the person that came and sat next to him leaving me in peace – well mostly. I think he’d split up with his girlfriend – he may have mentioned that once or twice! Generally the audience wasn’t what I was expecting but as I don’t know what I was expecting that’s hardly surprising! The music was fantastic. After a brief introduction John Tilbury and Eddie Prévost took to the “stage” – John playing prepared piano and Eddie a variety of percussion instruments in a number of unorthodox ways. I don’t think there was a sound from the audience in almost an hour of music. Sitting so close I could see how John used the piano to create his sounds but unfortunately the gong prevented me from seeing much of what Eddie was doing. I did see him play the gong with a violin bow and a metal seashell which he was pressing against the gong whilst rubbing it with a file. Marbles, a cymbal and a cake tin were among the other objects he pressed into service. After almost an hour the performance came to an end. I actually felt drained by the experience. I can’t explain adequately how much I enjoyed the performance. After the show I decided to head off but when I got to the door it was absolutely throwing it down with rain and, as I quickly discovered a thunder storm was also raging overhead. I make a quick dash back to the car but as I drove out of the carpark it became obvious that the storm was right overhead as clashes of thunder and flashes of lightning were happening almost simultaneously. It felt like a long drive home especially as the motorway was closed and I had to go on a detour via Sittingbourne and Rainham!